I was at a conference recently and one of the participants shared this story with me. Here’s another story. Entire species die if they can’t adapt to changes in the environment. Polar bears need arctic ice to catch seals. Because of climate change the ice caps in the two poles are melting and seal populations are diminishing. The news has been full of dangerously skinny polar bears helplessly slipping off melting ice because they are unable to catch any seals. BUT all is not lost. Polar bears, apparently, have decided not to wait for policy-makers to save their habitat and are engaging in new behaviours that have never before been observed in polar bears. They are eating dolphins – species of dolphins they have never eaten before – and burying parts of the dolphin in the ice to eat later. They are eating large amounts of snow geese eggs, seaweed and whale carcasses. And most incredibly, instead of hibernating in the summer, polar bears are coming on shore during the summer months and looking for food on land . Consider the magnitude of these changes: behaviours that have characterized polar bears for probably thousands of years are changing in less than a decade. Polar bears as a group are undergoing a drastic culture change. Why? Because you have to learn to survive. And when you learn, you change. Sustained changes over time become changes to culture. This, my friends, is what business owners have to do to stay current and profitable in a volatile economy. But maybe you aren’t yet convinced that YOU are the one who needs to do the learning. Yes, YOU – the CEO, COO, CFO, Operations Manager, Regional Director – a person of authority and influence in your organization. YOU have to be the one to make the first learning move, model it for the others, keep on doing it, and get those polar bear employees looking for dolphins, snow geese eggs and land animal food to keep the culture alive. Then you need to listen to what they learned and put it all together into a responsive business model. In 2007, David Herrera published a doctoral thesis that examines drivers of market share. To summarize, Herrera studied a large sample of companies using the Nashville Market Share 2004-2006 index and found that Indie market shares started higher at 97%, while major labels and major Indie businesses were in the negatives (-7% and -30% respectively, and remained negative through to the end of year two). Interestingly, however, the Indie market companies took a dive from 97% to 19% in year one, and then went up to whopping 134% in year two. Percentage of change for Nashville Market Share 2004-2006. After studying a number of variables, Herrera came up with the explanation that smaller organizations were hungrier to succeed and had greater fears that they would not survive than larger more established labels. As a consequence, like our polar bear friends, they began learning to adapt to the “new normal” environment. They were not successful in the first round because benefiting from mistakes takes learning, experimentation and reflection. But once the LEARNING began and they started to get the hang of things, they sky-rocketed up past all Major and Indie labels in terms of market share. A system to capture learning: Planning for and enabling small units to share knowledge with other small units and then actively building learning connections to overall business objectives. In brief, all three company categories (Major Label, Indie Label and Indie Market) were faced with the same unfavourable market environment, but only one, the category of learners (Indie Market), were able to make a profit and increase their market share, which is much harder to do. This was troubling to our then-doctoral student. After all, if people weren’t a factor, companies could easily implement these three factors into their organizations with a few “blue sky” meetings and a good project manager. However, there are a lot of reasons things are not that easy, a significant one being that fear is a strong motivator for people. Barriers to organizational learning come from individuals who, either from past experience or future prediction, perceive that disadvantages can be significant for those who step away from “tried and true” approaches. New methodologies inject levels of uncertainty into outcomes, and if outcomes are negative, it can affect who gets blamed for deficiencies and who gets laid off. Because intellectual capital is tied largely to the employees of any company, the ability to access this capital is tied directly the the level of voice the employees are willing and able to exercise within the organization. 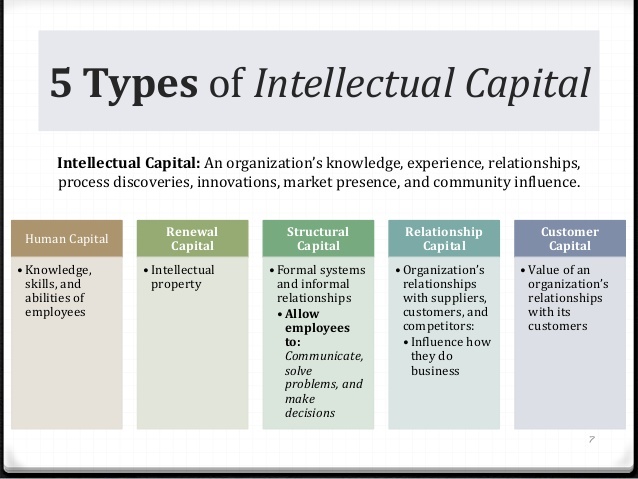 The image below categorizes the differing types of intellectual capital. As you view it, consider how the types of intellectual capital interrelate. According to Herrera, knowledge constipation – the kind that comes from an individual’s inability to effectively access intellectual capital because the barriers to organization learning are firmly entrenched – leads to a general lack of adaptability towards new technology, unawareness of market trends, lack of ability to respond to market changes and a measureable tendency towards decline in sales year to year. In short, without the free flow of intellectual capital among organization employees, a company puts itself in the path of endangerment, if not extinction. From these findings, Herrera moved to find models that explained the learning dimensions of those organizations who were successful and we can all benefit from his findings. 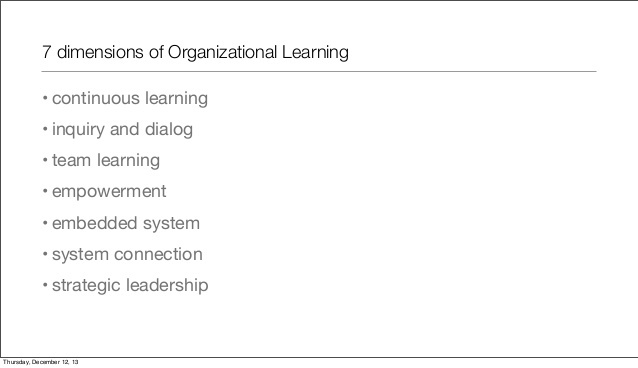 One very useful model in understanding how organizations learn is the Watkins and Marsik “7 dimensions of the learning organization.” The summary is below and the free questionnaire is available HERE; it will let you know where your company fits. When applied, this model works like this: operations move towards organizational culture and then organizational culture moves towards operations. Shared vision: Long-term goal focus helps everyone center on and continuously recommit to the shared vision. Team learning: Learning takes place in a group, uses all the diverse problem solving skills of individual group members to solve a common problem or reach a common goal. Bear team learning: In September 2016 it was all over the international news that a group of bears surrounded a Russian meteorological researcher team and wouldn’t leave until helicopters took the researchers out of the area. Bears are teaming up to take a stand. It looks like this one is also a check mark. So, you may be saying, “This all sounds great. We have those organizational barriers and the five dimensions of organizational learning make sense, but HOW do WE do it?” Here I invite you to look back to the polar bear example, see how to get started on this organizational learning journey, and commit to moving away from the “I already know everything there is to know” species toward the “We are going to figure this out or die trying” way of thinking. A climate of learning: How can we systemically encourage continuous learning, connect that new knowledge to the existing system, and how can company leadership effectively model our new learning? A climate of empowerment: How can we link our learning to organizational performance and how can we connect these to our overall market share? A system to capture learning: What do we need to do to create small, information sharing units in our organization? How can we connect these units, and how can we work together to link our learning to our overall business objectives? It will take more than a “10 tips to more market share” article can cover, but the journey will be worth investing in. Don’t you think we should be able to do at least as well as the polar bears? Are you up for the challenge? Talk to us about transforming your company into a learning, empowering system that can respond to market changes and increase market share: email info@shiftworkplace.com. Check out our Course Catalogue for online and blended courses for ongoing company learning. Correct on September 28, 2016.